We picked about 30 types of small to medium sized fruit trees. They would be placed at the left, right, and back of the garden. While it would be great to have some big durian and mango trees, the space was limited and we wanted fruits that the kids can pick easily to snack on. Using Trees to Build Swales? As I walk around the city of Singapore, I can’t help but constantly observe the grass, the soil, the trees, and the insects. It’s a job hazard and a rather enjoyable one. I have even become pretty good and figuring out soil fertility and moisture with my feet when I walk barefoot. Recently I have been noticing swales. For those of you unfamiliar with it, swales have become synonymous with permaculture as they were popularized by Bill Mollison and other advocates of permaculture. 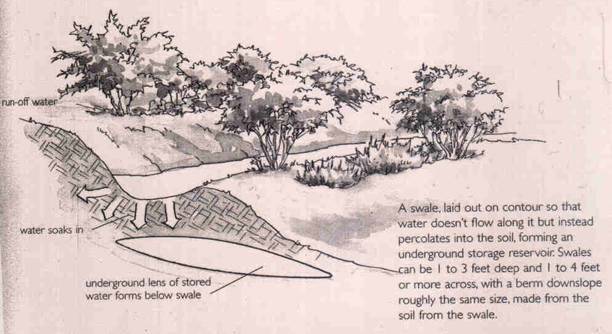 In short, swales are water-harvesting ditches, built along the contours of a landscape. They slow down water runoff, trap the water, and allow it to infiltrate into the soil. However it’s not something new; traditional farming societies have been doing it for thousands of years. Terracing is but another form of swaling. To learn more about swales, click here.